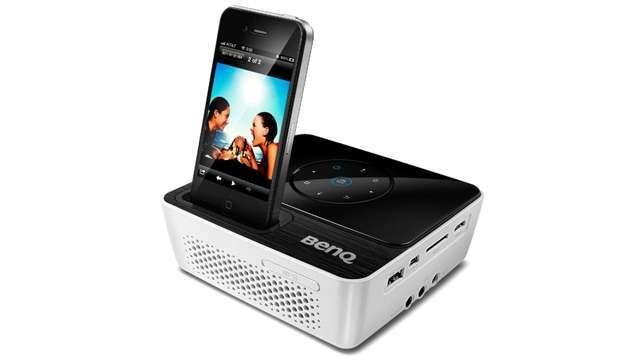 Joybee GP2 is a new projector from BenQ.This projector is palm sized and is aimed to be sold to frequent travelling business professionals. All in one apple iphone/ ipod compatable dock. Optional battery pack that costs Rs 5000 extra to last about 1.5 hours on full brightness and three hours on eco mode. 720p HD ready short throw projection [44 inches @ 1 metre]. PC,AV and HDMI Multimedia connectivity. Support of multiple video format including MKV via usb stick. Maximum of 160 inches screen size. File Transfer to 2GB onboard memory [1.3 GB usable] from computers. 30000 hours usage possible in ECO mode. BenQ Joybee GP2 and stand.